These necklaces can be done in any color or combination to create a lovely spring presentation. 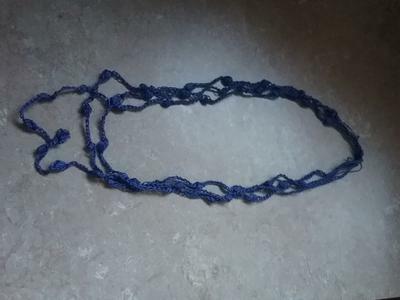 Chain 20, yarn over insert the hook in the next chain stitch, yarn over, draw the yarn through the stitch yarn over draw the yarn though the tow loops on the hook. In the same stitch, repeat the preceding step twice. 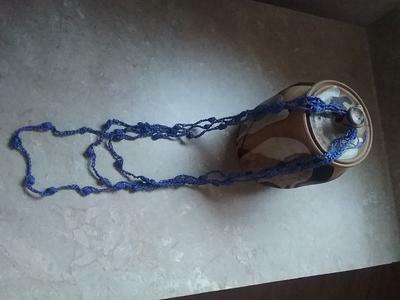 Yarn over and draw the yarn through the through all 4 loops on the hook* chain 1p. Yarn over insert the hook into the stitch yarn over draw the yarn through the 2 loops on the hook In the same stitch, repeat the proceeding step twice. 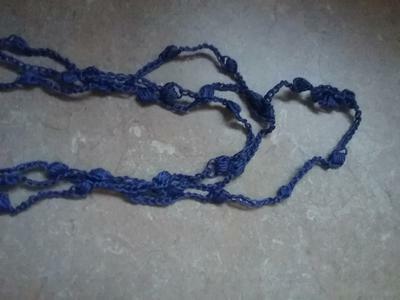 Yarn over and draw the yarn through all 4 loops on the hook* repeat from *to* 15 times or as long as desired ending with chain of 20.